Heat the olive oil over medium heat in a 2-quart saucepan. Stir the couscous into the pan and cook for 3-5 minutes until lightly browned. Pour the water into the saucepan slowly and stir well to combine. Reduce the heat to medium-low. Cover and cook for 12 minutes, or until the liquid is absorbed. Meanwhile, combine the basil, mint, almonds, olive oil, lemon zest and garlic in a food processor. Process until finely chopped. Stir the mint mixture and the sugar snap peas into the couscous. Season with salt and pepper as desired. Couscous! That’s what my kids yell when they see me preparing it. Whether it’s the small grains of couscous or bigger Israeli couscous, they adore the highly adaptable cousin of pasta. And when it’s a variety that is spiked and laced with veggies and herbs? All the better. 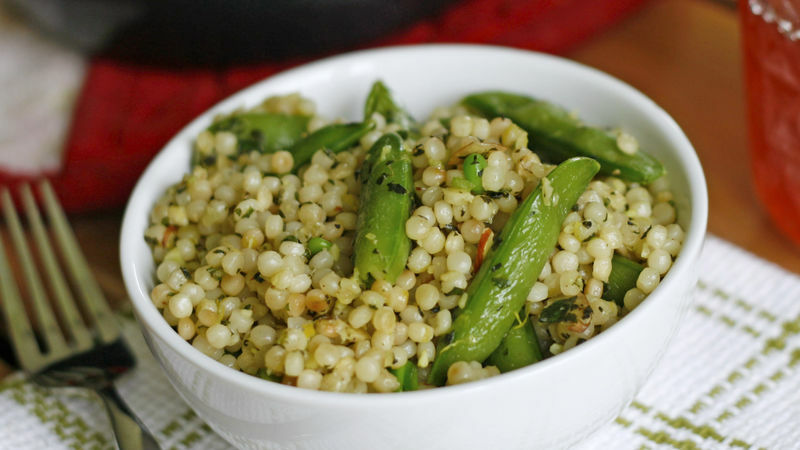 My Mint Pea Couscous is a new favorite. It combines a pesto-like herb concoction that includes mint, basil, almonds, lemon zest, garlic and olive oil. The mint flavor is present, but it’s not overpowering (the basil helps a lot with the balancing of it). And then sweet sugar snap peas are mixed in as well, adding a touch or crunch and, of course, sweetness. What I love about couscous (and my kids love about it too!) is that it’s so easy to flavor. You can instantly bump up the favorite with mix-ins, but you can also give it a lot of flavor by cooking it in a good chicken stock or the like. Heck, you could probably even make drunken couscous by cooking it in red wine -- though I haven’t tried that yet. Serve couscous with chicken, fish, beef -- whatever. And it can be served hot or cold, making it great for picnics or packing lunches.